I have to admit I love roasted peppers. Roasting them seems to change their flavor completely and makes them soft, juicy and sweet. They can transform a salad and give soups a unique flavor. The process is much easier than you think and once you master the art of how to roast peppers you will never go back to buying jars of roasted peppers again. There is simply no comparison. Buy when peppers are plentiful and in season. Cook up large batches then freeze or marinate in olive oil and you will have a ready supply of roasted peppers for your salads, soups and other dishes. They are also ideal for bruschetta and in antipasto platters. My favorite is oven roasting. Not only can you roast a large tray of peppers at once, but the peppers cook right through rather than just charring the skin, intensifying their flavor. This method works well for all peppers. The trick is to let the skins fully char and blacken. This makes peeling the skin off much easier and gives them their sweetness. Preheat the oven to 190ºC / 375°F. Line a baking tray with tin foil. 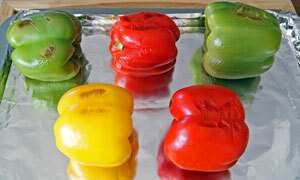 Wash and dry the peppers and arrange on the baking sheet. Leave whole with their stems on. This makes for easier turning. Place the baking sheet in the oven on the highest rack. Keep a close eye on the peppers and check after about 15 – 20 minutes. 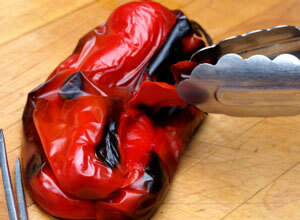 Once the skins have started to blacken turn the peppers over by their stems using a pair of long-handled tongs. Keep rotating the peppers and repeating the process until the peppers are evenly cooked. The skins will look wrinkled and blistered and should be browned on all sides. They will also look slightly collapsed, but this is normal. Place the pieces immediately into a plastic bag (you will need tongs or a fork as they will be hot) and close the top of the bag with a tie or a loose knot. Leave to cool for about 5 minutes. The steam trapped inside the bag will help loosen the skin making it easy to peel away. Remove from the oven and using the tongs, lift them by their stems and place into a large bowl. Cover the bowl tightly with plastic wrap, making sure it is well sealed and air-tight. Broiling is a much faster process than roasting, so you will need to watch them very closely and turn them more often. Also leave sufficient space between the element and the peppers. You don’t want them cooking too fast. You need the peppers to soften as well as charring. Set the oven to broil and line a broiler pan with tin foil. 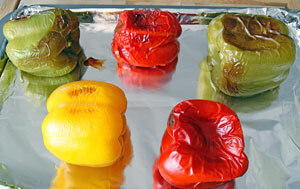 Turn the broiler to high and place the peppers on a broiler rack in the upper part of the oven. Cook until the skin begins to blacken and bubble, about 5 – 6 minutes, then give a quarter turn. Keep repeating this process until the peppers are cooked. Because of the intense heat the skins will blacken and char considerably, but don’t worry, you will be removing the skins anyway. This method is ideal for the summer months when it’s far too hot to turn on the oven and you are using your barbecue. Turn your grill on medium high gas or charcoal. You can grill them whole or cut them into pieces for grilling. If grilling whole, remember to turn them frequently. Although it’s probably easier to slice them first. Remove the ends then cut the peppers into quarters. Remove the seeds and the pith. Brush the peppers with a little vegetable oil (not extra virgin olive oil) and place the peppers flat on the grill, skin side facing down. Leave them to cook for about 12 – 15 minutes or until the skin is charred then remove. 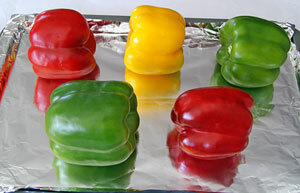 Once you have cooked and steamed your peppers they need to be skinned and seeded. If you’ve blackened them nicely this is a relatively easy process. Should you roast peppers whole? You will find that roasting peppers is more successful when they are roasted whole. Allow the peppers to cool. Roasted peppers become quite hot, but after about 20 minutes they should be cool enough to handle without burning fingers. Transfer the peppers to a cutting board. When the peppers are cool enough to handle, peel off the skin. It should come away quite easily. (This can get quite messy so it's best to work over a bowl). Cut out the stem and core. Cut the pepper vertically and spread out with the ribbed side up. Scrape out any remaining seeds and pith that remain inside the pepper. To store your cooked peppers place them in a glass jar and cover with olive oil. Make sure the jar has an air tight lid. They can be refrigerated for up to a week. Or they can be frozen. 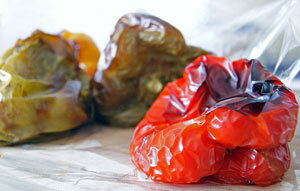 To freeze place peppers in zip-lock bags, seal the bag securely and store for up to 6 months. 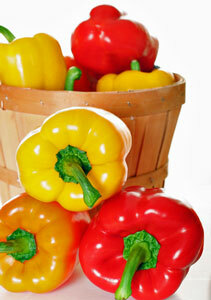 Choose peppers that are firm and unblemished. I also recommend using small to medium sized peppers that are roughly the same size, to ensure even cooking.